Learning how to make fun hats out of balloons is a special skill that you can share with both the kids and adults in your life. It brings smiles to many young faces and balloon hats are something that both kids and adults enjoy. Once you've learned how to make balloon hats, offer up your skills at parties, street fairs, school nights, picnics, or just during a Saturday morning playdate. Start the process by shaping basic hats and, after some practice, move up to fancy crowns, jester hats, and even a funky flower hat. You have to start somewhere, and it might as well be with the foundation for all balloon hats. This basic balloon hat only requires one balloon and three simple twists, though you will need to learn how to do a basic balloon twist first. Once you learn to make this balloon hat, you can move on to more complicated matters. After the basic balloon hat, try making a balloon helmet, which requires just two more quick twists. This hat looks more finished, and you can still quickly make these when you have lots of people who want them. Like the basic balloon hat, this one forms a foundation for fancier hats. By simply adding balloons, you can dress this one up in many fun ways. This colorful flower hat is a guaranteed hit at any party, especially outdoor spring and summer events. It combines a basic hat with a flower balloon, so by learning it, you're actually figuring out how to make three different pieces of balloon art. If someone doesn't want a hat, you could offer them up a balloon flower instead. While you will probably need a good number of green balloons for the stem, as well as traditional flower colors, like pink, red, or purple, for the petals. When you're ready to really show off your balloon-twisting skills, try making a crown. You will need a solid understanding of basic balloon-twisting, including a pinch twist, before attempting a balloon crown. Perfect for a little prince or princess, this cute crown will make a kid feel extra-special—and you'll probably be swarmed with kids who want one, too. It’s also great for an adult who’s celebrating a birthday or a promotion. If everyone wants a crown, the guest of honor deserves one that's a little extra special. Adding one more balloon to the basic crown creates a version that's fit for a king or queen. Though it looks complicated, it's not—just a few twists and pinches and you're done. 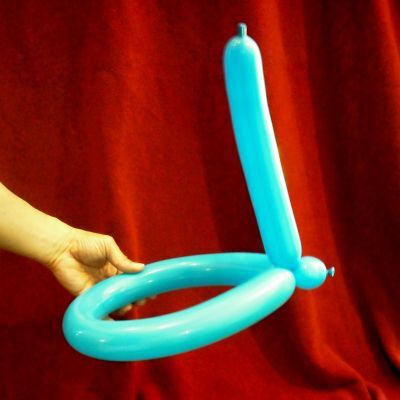 You will find it very helpful to have mastered the classic dog balloon first, though. With two balloons and the helmet in your balloon art experience, you can create a great-looking jester hat. It even has the bouncy tassels! This one is more challenging to make and a bit touchier when it comes to fitting, but it's worth the extra balloon and effort to learn how to make.